Plenty of people out in the world love pancakes, but a surprising amount of them have never once tried crepes. Offering the taste of a pancake in the style of an omelet, crepes offer a delicious flavor with an incredible variety for newcomers to test out. 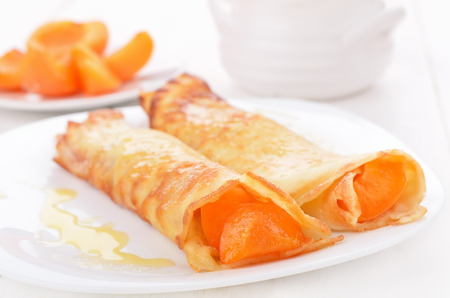 One kind everyone must try at least are crepes with apricots and Manuka honey! Avoiding an overabundance of sugar, these crepes provide the sweetness of Manuka honey, rather than something like jelly or Nutella, while adding healthy fruit to your day. If you think you need to give these crepes a try, check out our recipe below! Crack the egg into a medium-sized bowl, beating it and then adding the sugar. Stir in the orange zest, the milk, and the butter. Using a separate medium-sized bowl, add the flour, creating a well at the center. Then, stir in around one quarter of the egg/milk mixture until you create a dense paste. Stir in the remaining liquid. Set the batter down for about an hour (or more if you over-stirred and removed lumps) before continuing. Unless it’s a very hot day, you don’t necessarily need to refrigerate the batter. For the apricot filling: Cut the apricots in half, remove the pits, and then cut those halves into four slices. Over low-medium heat, set a large enough sauté pan and melt butter to coat. Add the Manuka honey, the apricots, and the vanilla bean seeds. Heat the filling for around ten minutes until the apricots have become soft. Feel free to add more Manuka honey if you desire. When the filling and batter are ready, heat a crepe pan using medium to high heat. Add a spot of oil or some butter into the pan, even if the pan is nonstick, if you worry the pan won’t easily release or you want extra browning. In the middle of the pan, pour roughly a 3∕4 cup of the batter in a quick motion. Spread the batter around immediately to the edges, making the batter as thin as you can get it by tilting the pan around in circular motions. That first side should take around two minutes, browning around the edges. Using a spatula, flip and cook the other side for roughly 20 seconds. For the rest of the crepes, cook one at a time. They can be stacked on one plate with nothing in between—they shouldn’t stick together if they’ve been browned properly. Place the apricot slices and the sauce in every open crepe, fold them over, and, if you want, top them with whipped cream. Enjoy! WOW, that sounds Delicuis!!! Definitely manuka honey is great for many uses. Normally we talk about it like a medical element due to its benefits, but we can use it to our daily need on cooking and still having all the benefits.